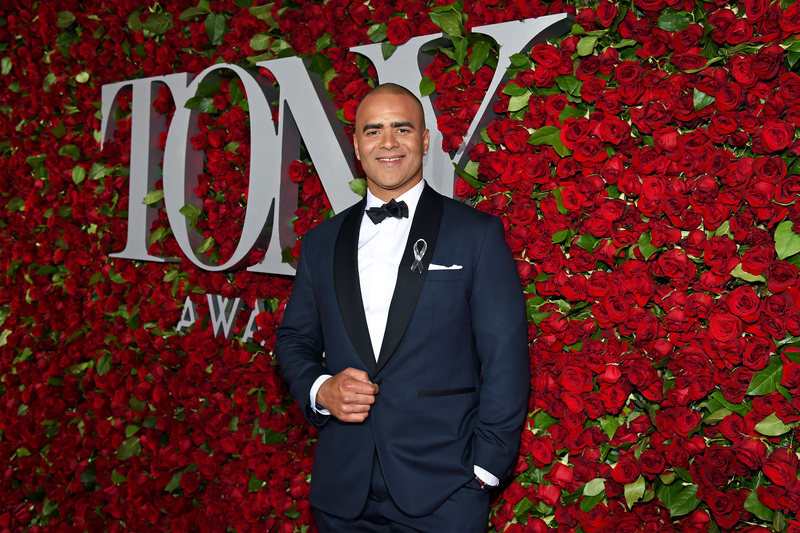 Hamilton fans, listen up: Chris Jackson, whom you may be more familiar with as George Washington in the award-winning (and seemingly impossible to get tickets to) musical, gave Bustle a really nifty tour of the Richard Rodgers Theatre that I think you'll be very interested in. If the inner drama geek that lives inside you didn't just pass out while reading that (and then struggle to be revived because obviously you can't pass out without watching!) you should definitely watch the video so you can truly get the Hamilton experience. Because not only was the tour amazing and good fun for any fan to see, it was also quite informative. In fact, there are a lot of lessons to be learned during Chris Jackson's tour of the Hamilton stage. Jackson, our trusty tour guide, obviously really knows his stuff, which is great for fans of the incredibly famous musical. For those of us who haven't yet been able to get our hands on some tickets (don't worry, someday soon our time will come — I'm so hopeful!) it is a treat to get to see even a glimpse of the fascinating phenomenon. Also, if Jackson ever decides to take a break from acting, it would not be a bad idea for him to get into the tourism business. Which is a good thing, because with Hamilton there, the theatre will continue to be packed every day! The Richard Rodgers Theatre, which is now becoming synonymous with Hamilton, also hosted Lin-Manuel Miranda's last musical In The Heights. Tony-nominated production designer David Korins only used a staircase and turntable with no moving parts for the scenes. This simplicity really must help viewers to focus mainly on the acting and story. Andy Blankenbuehler might have won a Tony for Hamilton's choreography, but according to Jackson, a lot of very real choreography is also going on behind-the-scenes — and it includes a whole lot more people. Dressers, props team, carpenters, and the rest of the crew run back and forth to make sure everything goes on stage at the right time. Most of the "quick changes" happen on stage in little wings located on the sides. Also, since there's not a lot of space on stage, things are hung everywhere. It seems stressful. Which basically means that it's made of wool, and very, very heavy. But doesn't it look breathtaking? Everyone's running around in these hot costumes dancing and singing, so a giant ventilation system is key. Sometimes, most of us don't even consider that the simplest things can be the most important. Apparently, there is a wall for celebrities who have seen the show to sign. Jackson divulged that Oprah was his favorite person to sign, but many more have left their mark — including Sting, Steven Spielberg, and Mel Brooks. Jackson's cluttered dressing room has a lot of Hamilton-themed items in his dressing room, from books to fan letters to "Hamilton" Coca Cola bottles to knitted George Washington figurines. 10. Jackson and Lin-Manuel Miranda Are "Like Brothers"
Miranda and Jackson have collaborated on so many things — In The Heights, Hamilton, etc. So, it's really no surprise that Jackson says they are so close. Cue all the awws you can muster. Jackson "goes homes and writes for an hour every night" and "has always been busy writing" — and though he admits in the video that writing musicals is pretty hard, I'd muster a guess we could one day be seeing a Jackson-penned show on stage. Though he does a "little harassing" of his fellow actors, usually Jackson is just getting ready for the big show by prepping his voice and his costume. Maybe it's still low-key impossible to get tickets to see Hamilton, but Jackson's live tour of the backstage is a small dose of the magical show. Thank you, Jackson, for letting us in on a few minutes of your totally awesome Tony Award-winning life.